As evidenced by the archives of my blog, we eat tons of salads in the summer. I can't get enough of my chopped summer veggie grilled salad, a classic caprese, watermelon feta salad, basic caesar, and everything in between. And now I have this amazing salad to add to the rotation. I first made this salad over Memorial Day weekend, and I served it as a side dish to grilled New York Strips. Wouldn't you know, I all but ignored my perfectly cooked steak, and just totally devoured this salad instead! I continued the obsession all summer long, making this for lunches quite often, and it makes for a wonderful dinner as well. I've never made a salad with two dressings, but the combination of the light vinaigrette and the drizzle of rich blue cheese dressing works so well. The bracing vinaigrette is mellowed by the blue cheese, and the pungent blue cheese is sharpened by the vinaigrette. Love all around. I have this bad habit of "remembering" what I need for recipes I've made in the past, and instead of checking the actual source, I just buy what I think I need. Unsurprisingly, this leaves me short of ingredients quite often, but I've gotten pretty good at improvising. Last time I made this, I was out of sour cream and buttermilk, and I used Mexican crema and mayonnaise instead with no ill effects. It's also forgiving for the herbs; scallions or grated onion work well in place of the chives, or add basil or parsley to the dressing or vinaigrette as well. You can roast the potatoes instead of grilling, and grilled zucchini is a great addition too. 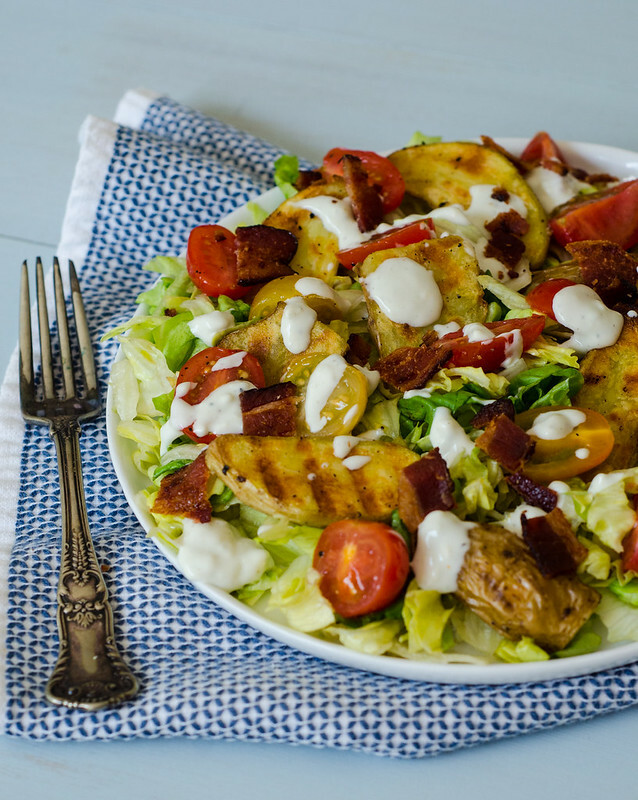 Basically, this is a super forgiving and adaptable salad, so feel free to take your own liberties with the recipe/ And should you have any potatoes leftover, they are ridiculously addictive dipped into the blue cheese dressing. There are several components to this salad, but they are all really easy and it comes together quite quickly, especially if you prep the dressing and vinaigrette ahead of time. Prepare your grill to cook at medium-high heat. Make the dressing: In a medium bowl, whisk together the blue cheese, sour cream, buttermilk, dill, chives, vinegar, and hot sauce. Taste and season with salt and pepper. Cover and set aside. Make the vinaigrette: In a mason jar, combine the vinegar, shallot, and mustard. Shake well to combine. Add the oil and shake again, then season to taste with salt and pepper. Cook the potatoes and make the salad: Put the potatoes in a medium saucepan and cover with 1 inch of water. Season with 2 Tbs salt, and bring to a boil over medium high heat. Boil for 3 minutes, then drain the potatoes in a large colander and rinse with cool water. Spread the potatoes on a rimmed baking sheet to completely cool and dry until you're ready to grill. They can sit for up to 2 hours at room temperature, or up to 8 hours, covered in the refrigerator. Meanwhile, toss the cherry tomatoes with 1/4 cup of the vinaigrette, 1/2 tsp salt, and 1/2 tsp pepper and set aside. Toss the potatoes with 1/4 cup of the vinaigrette, 1 tsp salt, and 1/2 tsp pepper. Grill the potatoes, turning once, for about 3-4 minutes per side, or until they are tender throughout and nicely marked. Taste and season with additional salt if needed. In a large bowl, combine the lettuce with basil and about 1/2 cup of the vinaigrette. 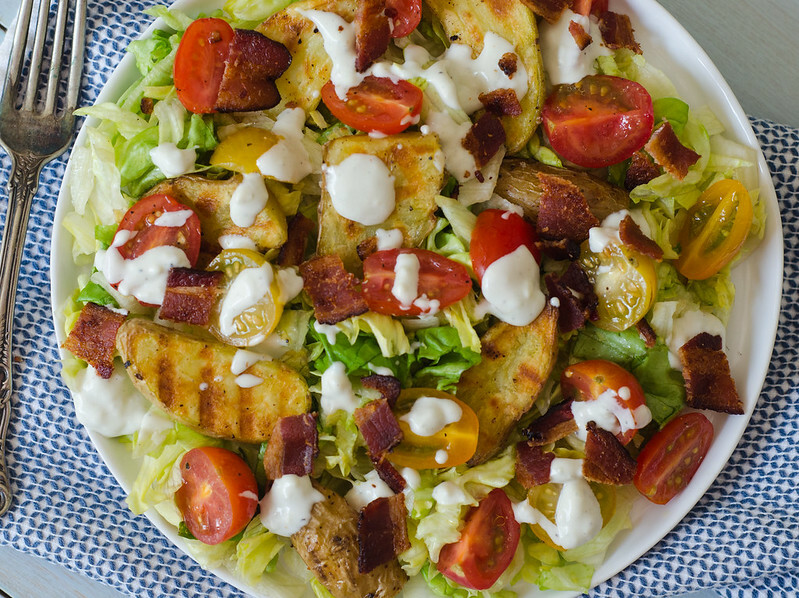 Divide evenly among plates and top with potatoes, tomatoes, and bacon, and drizzle with the blue cheese dressing. Serve. If there's one motto for our family, it might just be "waffles are always a good idea." They are our lunch of choice on Sundays after church, and we have them fairly often for dinner as well. Ironically, we rarely eat them for breakfast, but that's neither here nor there. Anyway, if we are having waffles for dinner, I like to mix up the flavors, and experiment with different combinations. One favorite of the summer has been zucchini waffles (recipe coming soon! ), and these corn waffles with blueberry syrup were a hit as well. My only issue with having waffles or pancakes for dinner is that oftentimes you're basically just having dessert for dinner… which, I mean, I'd be lying if I said I didn't like that. But every now and then I do try and behave like a responsible parent and feed my children nutritious meals. 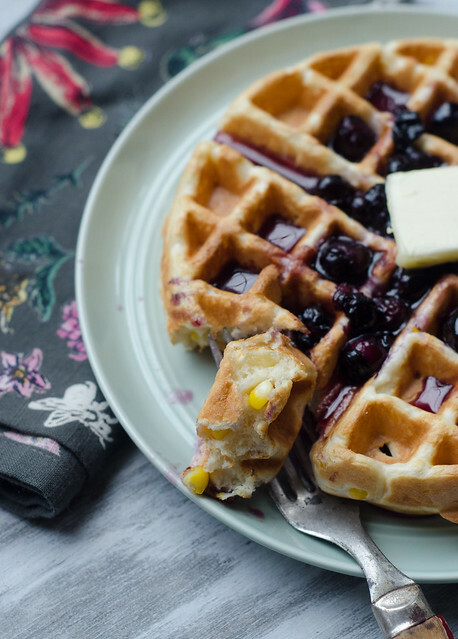 These waffles are definitely a little healthier since they have very little added sugar, and you're getting a serving of corn and blueberries in each waffle as well. Until a few years ago, I probably would have turned up my nose at the combo of blueberries and corn, but now I embrace the motto of "if it grows together, it goes together," and I'm basically just like "gimme all the corn and blueberries now." This chicken salad is amazing, blueberry cornbread is my favorite, and these waffles are the bomb. I like serving these with a simple fruit salad on the side, along with either bacon or chicken sausage to round it all out. We have Meatless Mondays, Taco Tuesdays, and Thirsty Thursdays… so shall we start a trend with Waffle Wednesdays? Make it happen! Gently stir the wet ingredients into the dry ingredients using a wooden spoon, stirring until just combined. The batter will still be thick and lumpy. Fold in the corn kernels. Follow the directions on your waffle iron to cook the waffles. As they are finished, place them in the preheated oven to keep warm as you cook the rest. Meanwhile, melt the remaining tablespoon of butter in a skillet set over medium heat. Add the blueberries and cook, stirring often, until they begin to soften and give up their juice. Add the maple syrup and cook until heated through. Remove from heat and cover to keep warm. 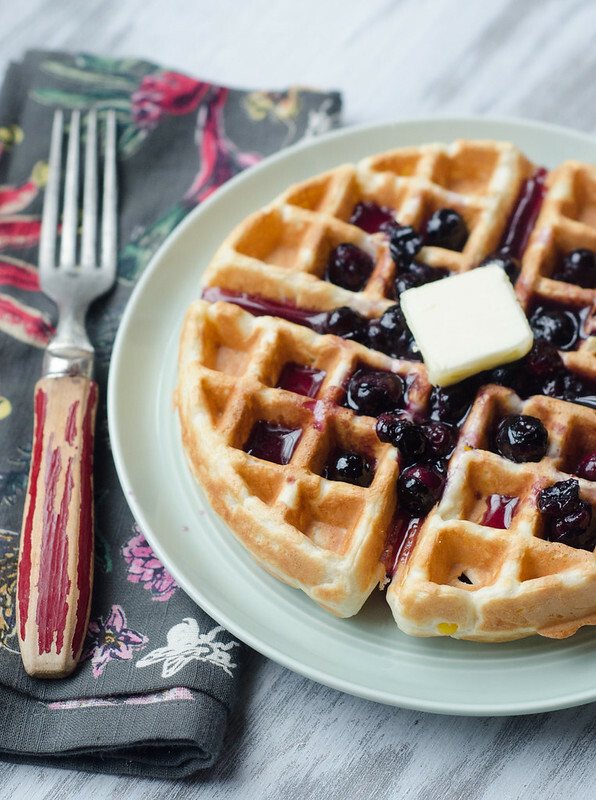 Serve the waffles warm, with the blueberry syrup and more butter, if desired. Let's try this again, shall we? It's been a minute since my last post, and it's been even longer since I shared recipes on a regular basis. As I said in January, I've missed this space terribly, but it honestly just hasn't been my priority for the past year. I just wasn't in the right mindset, and I didn't want to simply phone it in and post for the sake of posting. 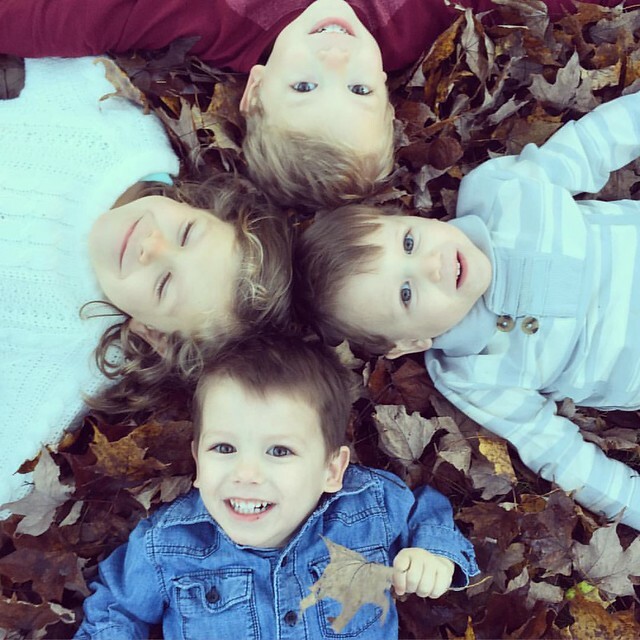 I want this blog to be sincere and honest, and I want to be excited to share with you! I'm psyched to pick it back up though; and I swear that's not just an empty promise. I've found that I'm a better mom, wife, and person when I'm doing something I enjoy, and I really do enjoy blogging. I already have some delicious recipes and dinner plans lined up for you, and my list of recipes and ideas is growing by the minute -- nothing inspires me quite like summer produce! I'm also working on a mega-post full of meal plans, menus, and recipes for summer. Since it's been so long since I've posted, I thought a recap of some of my all-time favorites might be in order! I know that title's a little crazy, but this pizza is a mouthful, both in name and flavor. There are so many wonderful things going on here, but the creamy pumpkin sauce, truffled gouda, and herbed ricotta are the highlights and thus deserve top billing. I started with a creamy pumpkin alfredo-type sauce -- just a standard white sauce with the addition of a little tomato paste and pumpkin puree. That in and of itself was great, and the extra sauce made for an excellent dipping sauce for the crust. 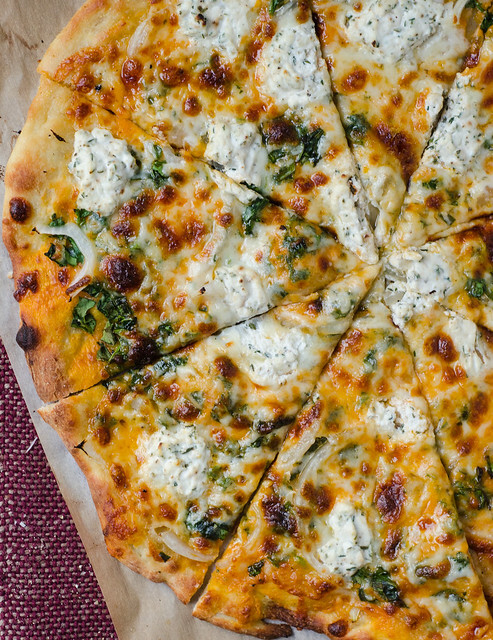 I topped the sauce with fresh spinach and onion, then finished it off with a cheesy trio -- mozzarella, truffled gouda, and dollops of herbed ricotta. The result was one of the best pizzas I've ever made. I try and keep a general rule here that I don't post recipes that use specialty ingredients, so I was a little weary of sharing this one due to the truffled gouda. But I see it pretty regularly at Whole Foods, and my Trader Joe's has a truffled Italian cheese that's akin of fontina, and that works as well (I tested it just for y'all. ;)) In a pinch, you could easily use plain gouda and then finish the pizza with a little drizzle of truffle oil. 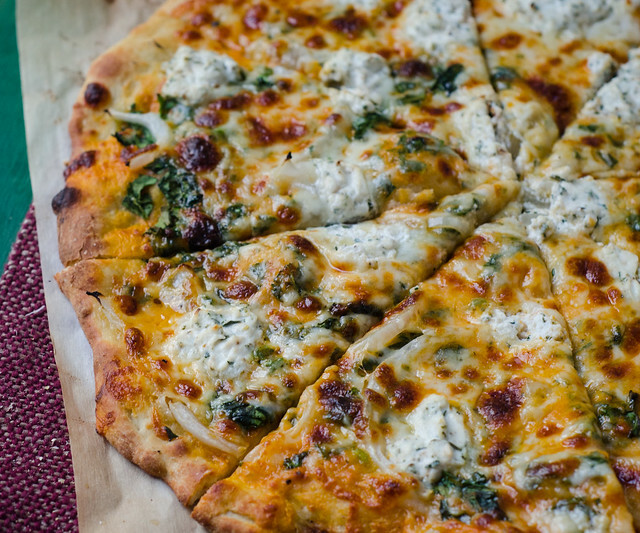 I love to serve this pizza with my shredded brussels sprouts salad (but I leave the cheese out of the salad since there's so much on the pizza); the flavors go really well together, and it makes for a lovely and simple meal. On an unrelated note, as we enter the new year, and I plan for my blog, I'd love to hear from you! What kinds of posts and recipes would you love to see here? Any specific ideas, foods, round-ups, tutorials, etc? 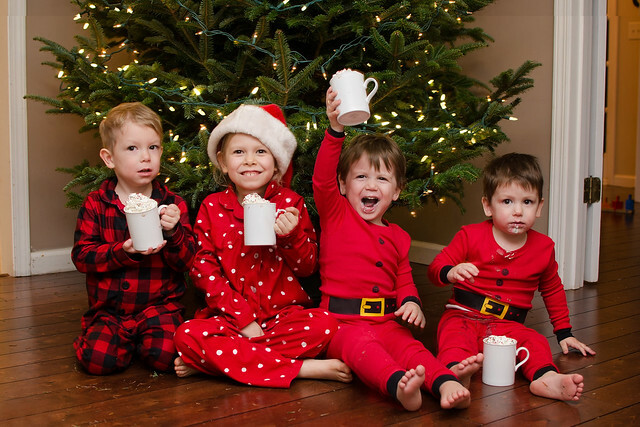 More or less of my kids? ;) I'm open to any and all suggestions! Meanwhile, melt the butter in a small saucepan over medium heat. Add the flour, tomato paste, and garlic, and cook, stirring continuously, for about 1 minute. Whisk in the milk, reduce the heat to medium low, and cook until thickened, stirring often, about 3 to 4 minutes. Remove from heat, fish out the garlic clove, and stir in the parmesan cheese. Season to taste with salt and pepper. Set aside. Sprinkle a large square of parchment paper with cornmeal, and roll and stretch the dough into a 14-16 inch circle, or large oval. Brush the perimeter of the dough with olive oil. In a small bowl, combine the ricotta with the thyme, rosemary, and parsley, and season with salt and pepper. Set aside. Spread a thin layer of the sauce over the dough, leaving a 1 inch border. Scatter the spinach and onions over the sauce, then sprinkle the mozzarella and gouda over the vegetables. Using a teaspoon, dot the top with the ricotta. Transfer the pizza plus parchment to the preheated stone, and cook 10-12 minutes, or until the cheese is melted and the crust is golden brown. Remove from oven, allow to cool 10 minutes, then slice and serve. Wow. So I haven't posted since October. Sorry about that! I felt very overwhelmed and was really busy this fall, and just needed to let something go. So I'm sorry about the radio silence here, but it was much needed on my part. I thought that maybe if I took a break from the blog, I could keep my house clean, get in more workouts, have more time to read and pray, and generally just get my head above water for a bit. Well, as it turns out, my house is still messy. I still miss more workouts than I'd like to admit. The only books I read lately are about autism treatments and nutrition. And I still feel like I'm barely treading water most days. But here's the thing -- I miss this place! I miss taking pics of my food, I miss writing, I miss hearing from you guys. Can we try this again in 2016, pretty please? When I first sat down to write about 2015, I looked back at the recipes I shared with you; but to be honest, 2015 was not about the food for me. 2015 was about Henry. 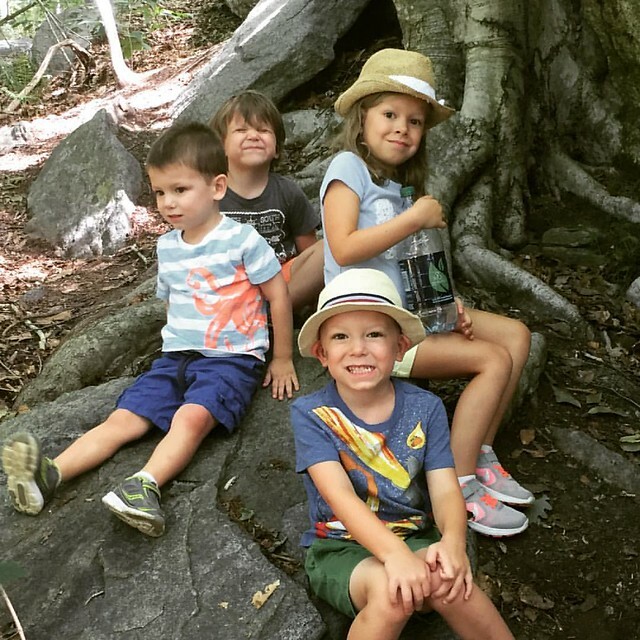 I could say that a dark cloud was cast upon the year because of Henry's autism diagnosis. It's been way too easy for me to get bogged down in the negativity, fear, and sadness associated with that diagnosis. Believe me, I feel all of that! But then I look at what he's accomplished and who he is. He went from being completely nonverbal in June, to having a vocabulary of almost 100 words in December. He is quite literally obsessed with animals, and he can tell you the sounds of almost any animal you can think of. When he wants milk, he asks for milk, rather than throwing himself down in front of the refrigerator, screaming and crying. He looks me in the eye. He holds my hand. He gives me kisses if I ask. And he calls me mommy, Joey Daddy, and Tucker "Tuck Tuck." He's such a special little boy, and I am constantly amazed by him. We have some pretty tough and stressful decisions to make about his future in the next few weeks; but based on the progress he's made in the last three months, he is so ready to fly, and I can't wait to see how high he'll go. Henry is not our only child though. 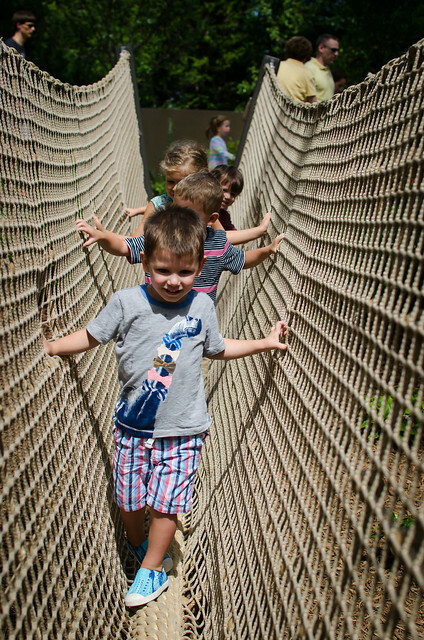 We had lots of adventures and fun with the other three as well. 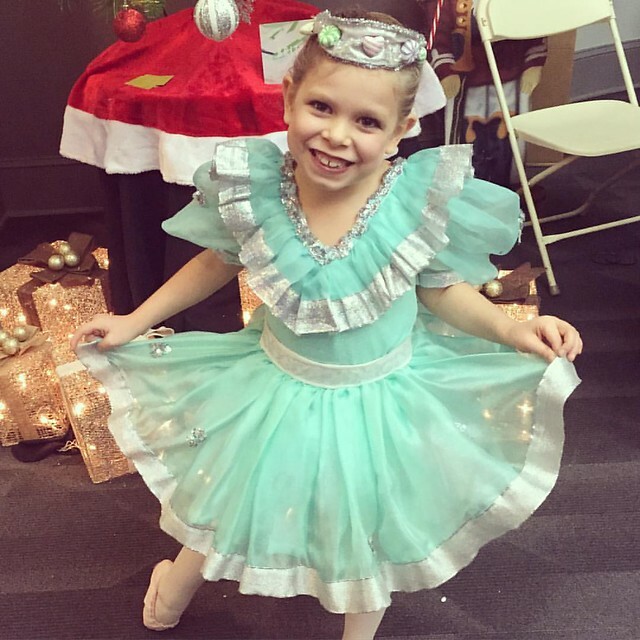 Smith played t-ball, Tucker's personality continued to shine bright and bold, and Caroline performed in a local production of The Nutcracker. Perfectly cast as a cupcake, she was adorable and sweet, and she's already talking about what she wants to be next year. Spoiler alert: the Sugar Plum Fairy. So 2015 was tough. It tested me, it was just hard. We went though a LOT this year. But we started 2016 with a bang. 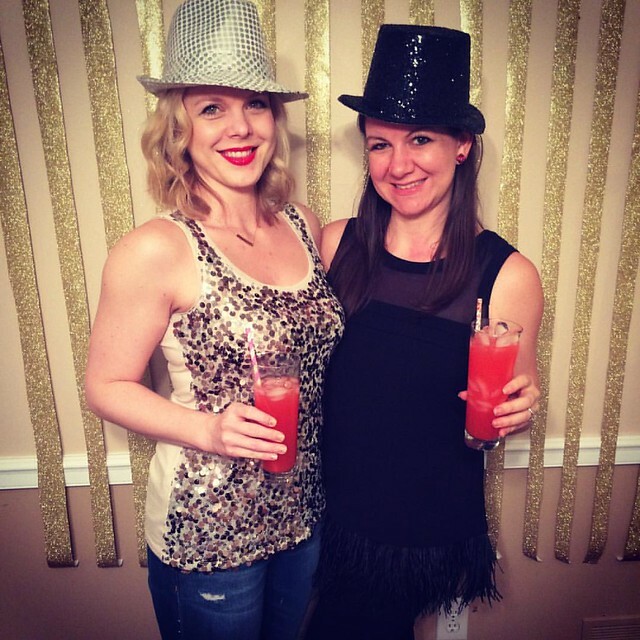 My girl Annie and her sweet family came to visit us over the New Year's holiday, and we rang in 2016 with Mexican food, blood orange-passion fruit margaritas, dancing, and fun. We laughed, ate, and talked our faces off, and I could not have asked for a better time. If that is any indication of what the new year has in store, then I am excited and blessed beyond belief!